One of the thoughts I had was to make the 2 airboxes like a thermos design. Sandwich inbetween 2 layers of CF a heat resistant material that will keep the insides of the airboxes cool and protected from the engine heat. This will allow the CF to look nice in the engine compartment and not require us to use ugly heat wrap on the outside. I was also thinking of getting them to copy our intake tubes in CF and have them made with heat resistant material inbetween 2 layers also. If this "pilot" project works out, I think we will definitely explore other avenues. Last edited by Kev04C320; 07-18-2006 at 10:32 AM. I assume you will provide the correct size hose adapter and clamps for us stock guys, and maybe some installation instructions for us not so smart people? Out of curiosity (and you don't have to answer if you don't want to), but how much, in US dollars, do you think you have infused into your car for aftermarket mods? You're the man! Thanks for taking on this project! Can someone explain what is so wrong with the stock design that can cost 15/20 rwhp ? Mikey.. Buddy... Are you in ? I think the best idea is to create the box with 80mm openings so that when people are ready to upgrade this design will be optimized for it. At the same time a simple silicon reducer will allow stock TB cars to attach to it. I think you are confused about what we are doing. The airbox will operate just like the stock one does now. Nothing is changing other than the look and the size. It still has the same overall design as the stock one. The tubes will still be in the front grille so there is no extra issues with dirt, salt etc.. Whatever problems you have with dirt with stock setup is the same that you will have with this new setup. It's simple.. For the stock motor, running stock boost, the engine flows X amount of air. The stock airbox was design by MB to flow X amount of air so everything is fine. When you start adding headers, ECU, pullies, you increase the airflow capabilities and therefore start running into restrictions. One restriction we found was the 74mm TB. The other is the airbox. Putting on the bigger airboxes allows the car to feed the extra air the motor needs and therefore produces more power. One of the rules I've always had over the years of modding cars is never to keep track of my invoices or money spent.. I would probably have heart attacks if I knew how much was actually spent.. I will put together an install package with instructions & pics and provide everything necessary to get it on your car. Have to get pullies and ECU 1st....to complete stage 2 !!! I am in. With any performance mod the intake and exhaust is usually the frist mod you do. I am still stock but will only do a pully and ecu when its all said and done. What i would like though is the tubes leading to the box coated or wrapped in heat resistant material just like the box. That would be great. Thanks Victor ... OK so for stock runners the airbox may not yield so much additional RWHP's but it sure will look sweet! Combined with the VRTB it may be a better overall solution. Also note MKB do a "optimized air intake duct" - you may want to quiz them about that design perhaps - anyone got pics ? Last edited by stevebez; 07-18-2006 at 12:11 PM. Last edited by MNG; 07-18-2006 at 01:27 PM. I believe those are the smooth tubes that come out of the grille.. This is the same idea that I had in my head when making the CF intake tubes. Also note MKB do a "optimized air intake duct" - you may want to quiz them about that design perhaps - anyone got pics ? Hey, hey.. what about the 80mm VRTB ??? You want one of those to go with this dont you?? I am still stock but will only do a pully and ecu when its all said and done. Count me in for $200! I also would like the air intakes to be dressed in order to address the issues of heat soak. Is that possible in your experiment? My friend John (jparch on the board) emailed me and said he was in for $200. John: Post a reply here so everyone knows who is involved. We are now at $3,400 !!!!! I called and put the order in for the airbox (Renntech).. 2 week backorder... Waiting on confirmation of final price w/shipping. Will go setup a meeting with CF manufacturing company. P.S-> There are a couple of mod-aholics that are missing from this thread!! You guys know who you are!! You dont want a nice CF airbox under your hoods with matching CF air tubes? Once I receive the confirmation of shipping I'll ask you guys to send in your money.. The idea will be to incorporate the heat wrap material inside the tubes if possible.. I'll see what feedback I get from the company once I meet with them. I am good for this one. Let me know where to send it. Gotta support so if anyone back out, get at me Vic! wow vrus you ve really hooked the beast up! im in for 200. We've raised $4,000 !!!!! in 1.5 days! My buddy is meeting with the CF company in about 15min to go over the options. 2) Price per airbox for 15 orders WITH heat insulated material inside the CF. 3) Price per airbox for 15 orders with NO heat insulated material. 4) Price per set of air tubes WITH heat insulated material inside the CF. 5) Price per set of air tubes with NO heat insulated material inside the CF. Once quote comes back we will decide if we move to the next step. This will allow people a choice of whether they want to purchase the airboxes, air tubes or both. It allows people who dont want an airbox change but do want some nice CF air tubes that are insulated to be purchased separately. Last edited by vrus; 07-18-2006 at 03:57 PM. Where have you been hiding? 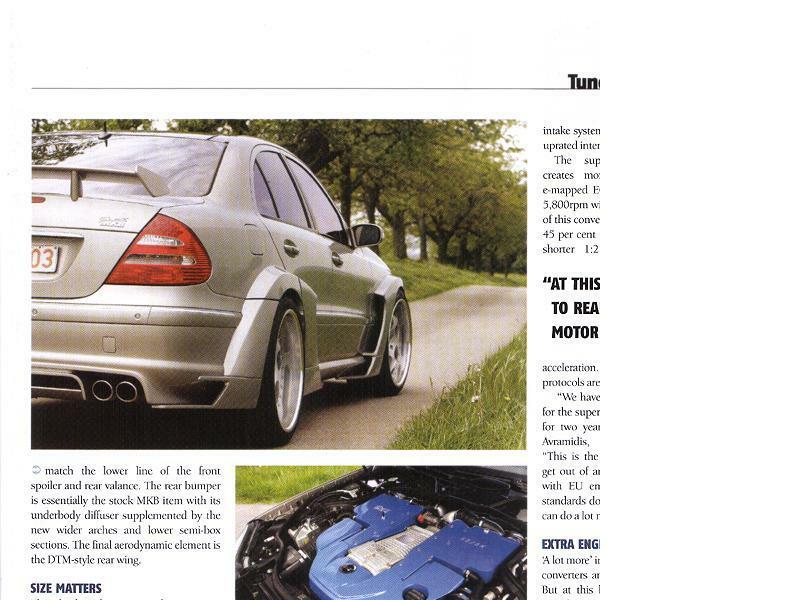 Tell me you still have that E55 beast of yours! yeah its been a while. after spending 30k just to get back to normal and spending even more on f ing lawyers and engineers i just said f it. i have 2 reports stating why i was right and my lawyer is just a leach. arent they all? apologies for lawyer buddies here the fire in me is gone. there are people who are wrong and those who are right. ive done what i needed to. prove myself right. i live by doing whats right in whatever i do and ill get mine back. those who scrim and scrape for every last dollar get theirs too except in a bad way. so im done with them. im back to contribute with my pals and those who ive never met but im putting my problem to bed. still got my e. 9000 whole miles on it and its itching for a new NON-CRANK mod. cant wait. nice to be back vrus, your a good dude. Anything I can do to help you let me know!! I've got a full Star Diagnostics, access to ECU programmers, etc, etc.. Oh yeah.. and a nice 80mm TB.. LOL... Whatever you need... Let me know. BTW.. I am really sorry to hear about all the troubles you went through and glad to see you made it past it. I know you are a stand up guy, but, in that situation it looked really hard to determine who & what was at fault. you know, my car runs a little funny. at idle when i start up its runs a little rough, kinda lumpy for about 5 seconds. it surges to about 1800-2000 rpm at initial startup too. i would just like to retune it to stock. i still have headers and resonator deletes. can your system do that? how much was the tb too. The Carbon Fiber master of all ages. Koenigsegg used to have meetings, "Okay how can we get a little more CF in the car...ya know like Mike's??" Jesus, you guys are loaded.